Some destinations are so perfect that every view you turn to could be an amazing photograph. Some are by the beach, and others are in cities so perfect they leave you breathless the moment you arrive. If you’re finally wanting to break into the bank and give in to temptation, here are some of the most idyllic destinations on the world to help inspire your next vacation. Located in French Polynesia, Bora Bora is an intimate island where luxury hotels rest casually on the turquoise water. The protected lagoons and reefs mean you have direct access to some of the most beautiful scenery in the world, right outside of your room. Luxury bungalows offer a private yet exclusive stay where you can indulge in the island’s beauty without touristic high-rises or other nuisances. The island is virtually untouched when compared to more pronounced destinations like Waikiki, and this creates a truly idyllic atmosphere that can only be called paradise. With a gigantic dormant volcano, along with endless reefs and trails to explore, Bora Bora is a profound destination for any occasion. Venice is the gem of Italy, and it’s an idyllic destination in any season. While the historic impact of Rome often overshadows it, and the artistry of Florence can’t be beat, Venice remains a picturesque city without comparison. 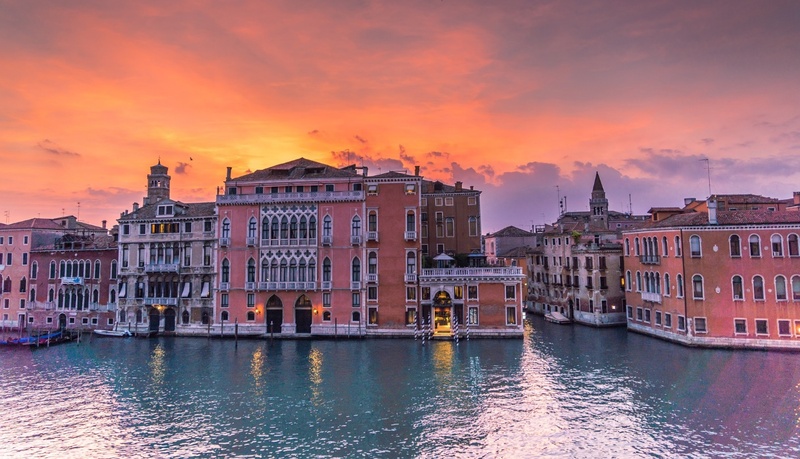 It features the best of Italy from the art to the architecture and food, but by being on a series of canals, Venice takes on a mythical aspect that can’t be described. A gondola ride will transport you into another world as you glide past historic and colourful buildings, and this is why it remains one of the most romantic and exciting destinations today. Located about an hour from San Francisco, Sonoma is one of California’s treasures that provides vast mountain views along with scenic vineyards and timeless cottage-hotels. The atmosphere is low-key yet sophisticated, and the aroma of fresh grapes permeates throughout the area. Aside from wine tasting, vineyard visits, and general relaxation in the great outdoors, you have the privilege of visiting San Francisco without having to stay in the chaotic city overnight. This gives you the best of both worlds, and it allows you to enjoy the bay, city life, and hilly comfort of Sonoma in one day’s time. Located in the Indian Ocean, the Maldives is a sprawling nation with over 1,000 islands and pristine coral reefs. All of these islands make 26 atolls which are connected by the reefs. In the capital Male, you can explore ancient buildings along with incredible beaches and cultural relics, but the beauty of the Maldives comes through its collection of luxury hotels and resorts that blend brilliantly into the island. Experience unmatched intimacy and relaxation on a private white sand beach, or head into town by boat in just a few short minutes. The Maldives has stunningly clear water, untouched nature, and a natural island feel that makes it an idyllic and divine destination year-round. Nestled in the Aegean Sea, Santorini is an imaginative and luxurious destination that illustrates the best of Greece. The hillside city is complete with white villas topped with stunning blue trim, and each curvy building follows the same pattern to bring an incredible flow to the landscape. Of course, nothing beats the seaside views and warm winds, and it’s hard to imagine a more picturesque city than Santorini. You can enjoy walking through the winding streets and finding new views at every turn, and there are also numerous markets and galleries for a charming cultural excursion. These destinations make for a perfect holiday, and you can be rest assured that they look even better in person. Whether you choose a beachside destination or an ancient city, these idyllic spots will it your best vacation yet.